Downy mildew | Infonet Biovision Home. (c) Clemson University - USDA Cooperative Extension Slide Series, www.insectimages.org. Downy mildew (Pseudoperonospora cubensis) on cucumber. 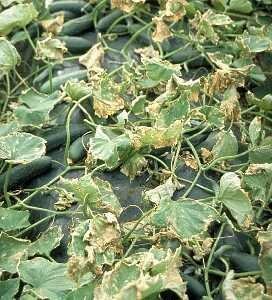 Severe defoliation of cucumber caused by infection from downy mildew. Fruits are not infected, but those that form are small and do not ripen properly. Damage caused by downy mildews is usually associated with the sporulation of the fungus. Sporulation of Peronospora destructor can cause up to 55% reduction in the dry weight of onion leaves (Yarwood, 1941). The corresponding figures for Pseudoperonospora humuli on hops and Peronospora farinose on spinach were 17 and 48%, respectively. Losses from downy mildews can be considerable. It is estimated that in 1962 downy mildew of tobacco (Perenospora tabacina) reduced yields in Europe by at least 100,000 metric tons (Peyrot, 1962). Plants can be infected at any time during their growing period. 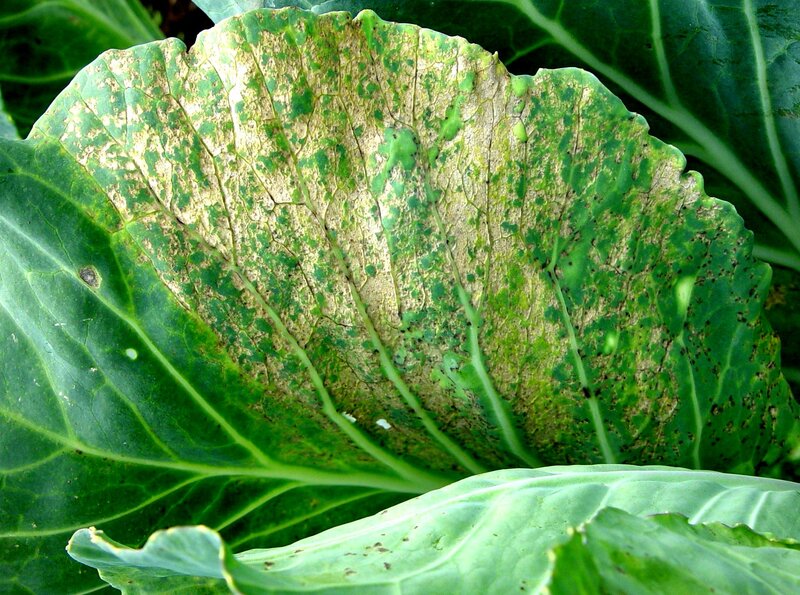 Symptoms of downy mildew infection include small, pale yellow spots with indefinite borders on the upper leaf surface. Purplish discolouration of the upper leaf surface is seen on some hosts. A downy growth (sporangiophores) may be seen directly under the spots on the underside of the leaf or on fruits or stems early in the morning or when foliage is wet. Young leaves and cotyledons may drop off when yellow. Thus, the disease can cause severe damage to seedlings in the seedbed. Older leaves usually remain attached, and affected areas enlarge, turning brown and papery. When the disease is severe, whole leaves die. Seedling stage, vegetative growing stage, flowering stage and fruiting stage. Flowers: fungal growth; flower abortion; flower drop. 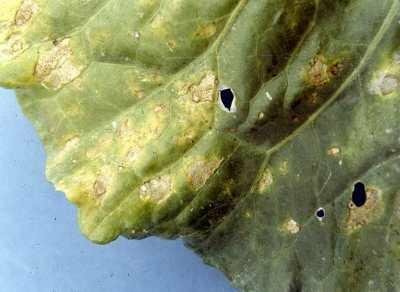 Several different fungi cause downy mildew disease on vegetables, fruits, ornamentals, forages, field crops and tobacco. These include Albugo spp. (crucifers), Bremia spp. (lettuce), Peronospora spp. (cabbage, tobacco, spinach, soybeans, alfalfa, onion, many ornamentals), Plasmopara spp. (grape and sunflower), Pseudoperonospora (cucurbits), Peronosclerospora (sorghum and maize), Sclerospora (grasses, millet), and Sclerophthora (maize, rice, wheat). Downy mildew fungi are fairly host specific. The downy mildew fungus that infects one type of plant (e.g., rose) is not the same downy mildew fungus that infects another (e.g., grape). However, if you see downy mildew on one plant, then environmental conditions (i.e., cool, wet weather) are favourable for development of downy mildews on a wide range of plants. Downy mildew of grape, spinach, and tobacco causes serious economic losses. It spreads rapidly through fields and is dependent on a wet, humid environment with cool or warm, but not hot, temperatures. A film of water is needed on plant tissue for spore germination and infection. Further below you find concrete preventive and curative methods against Downy mildew. 2. Use only certified diseased-free seeds for sowing. Transplant only healthy seedlings. 3. Ensure proper land preparation to make sure that your soil is well drained. 4. Provide adequate plant spacing to reduce the density of the canopy and minimise humidity. 5. Pruning of new growth also helps proper plant's aeration. 6. Remove infected plants and prune infected shoots. 7. Properly dispose of collected diseased-parts either by burning or burying them. 8. Avoid overhead watering. It lengthens the duration of leaf wetness and favours further development of the disease. 9. Plough-under all the plant debris after harvest. Control should be emphasised in nurseries since downy mildew is particularly damaging in the seedbed. 1. Seedbeds should have well-drained soils and be sited away from hedges and windbreaks. The site should not have been under susceptible crops for at least the previous 2 years. 2. Seedlings should not be excessively watered. 3. Weeds should be eradicated in and near seedbeds and out in the production fields. 4. Crop residues should be removed from the field after harvest. 6. Thin plants to reduce plant density and increase air movement. 7. Time irrigations so that they do not elongate leaf wetness. 8. Alter planting dates to avoid periods of high disease pressure. There are many copper compounds that are used as fungicides. The most common are derived from either copper hydroxide or copper oxychloride. These products are readily available in most third world countries and very reasonably priced. Copper products are still accepted in organic farming provided that the number of applications is strictly followed and a proper soil amendment is observed to prevent copper accumulation in the soil. For information on Copper click here. For information on garlic bulb extract click here. Dobson, H., Cooper, J., Manyangarirwa, W., Karuma, J. and Chiimba, W. (2002). Integrated Vegetable Pest Management. Natural Resources Institute (UK). ISBN: 0-85954-536-9.